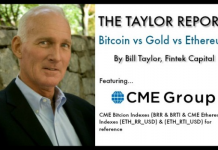 In celebration of the Chicago Mercantile Exchange’s (CME) launch of two new bitcoin indexes (BRR & BRTI), FintekNews is comparing the price of bitcoin and gold on a daily basis. The next SEC decisions on bitcoin ETF’s are already being priced in as a “no”. Gold held steady. Resistance at $1250. Bounce from $1195-$1200 looks like short covering and some new longs.